Scope of Project: The project involved installation of 9” depth roller compacted concrete pavement for the driveway into the cement terminal. Work was completed on the weekends so the facility could remain open during the week. 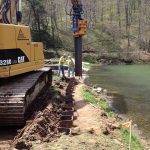 A railroad track crossing was also installed as part of this project. Scope of Project: The project involved installation of a 6” depth roller compacted concrete pavement for the apron along the building and docks for truck parking. 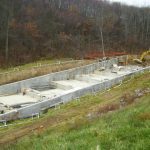 Scope of Project: The project involved excavation of the existing dam, placement of Roller Compacted Concrete for overtopping protection, and installation of a new concrete spillway. Scope of Project: This was an Economy Recovery Project involving the reconstruction of two to four lanes of full depth (9”) concrete pavement reconstruction, new concrete shoulders, guide rail updates, washout repairs, minor drainage repair, bridge work consisting of expansion joint repairs, deck overlay, substructure repairs, and new approach slabs with pavement relief joints and other miscellaneous construction. 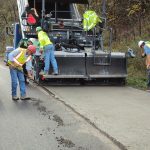 It consisted of breaking and seating the existing concrete pavement and overlaying with 5 1/2 “ of super pave.